Prospective new student applications are online here. Parents are asked to read The Case for Classical Christian Education by Douglas Wilson prior to the admissions conference. New student applications require a $225 application enrollment fee. Families will be notified of acceptance once the admissions requirements are met. We are pleased to continue our quick and easy enrollment process called Continuous Enrollment. 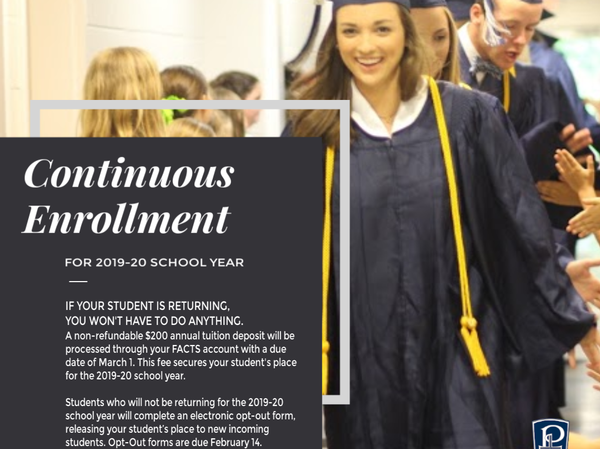 Continuous Enrollment allows your student in good standing to be enrolled until graduation unless you opt-out. Opt-out allows us to know if your student will not be returning and releases your student's place to a new incoming student for the upcoming school year. A non-refundable $200 annual tuition deposit will be processed through your FACTS account with a due date of March 1. This fee secures your student's place for the 2019-20 school year. Students who will not be returning for the 2019-20 school year will complete an electronic opt-out form, releasing your student's place to new incoming students for the upcoming year.